kulam koNdu kAriyam yen kURIr? palam koNdu mILAdha pAvam uLadhAgil: This refers to the condition of certain people who go after petty benefits like money etc. Subsequent to that, they may have an opportunity to listen to great saints who talk about its futility. These people still do not seem to rectify their mistakes, rather keep going back after temporal wealth. These people are the ones who are engulfed by bad karma. The word “pAvam” can also mean “memory”, in which case it would mean that these people cannot seem to have a memory that prevents them from going back to how they were originally; i.e., during the times when they had the knowledge that the soul is always subservient to perumAL. These people listen to the advices of their AchAryan, learn through SAsthras like bhagavadh gIthai etc. Still they commit the same mistakes forever and area unable to declutch themselves from the wrath of bad karma and continue to multiply it forever. kulam koNdu kAriyam yen kURIr? : If one were to have desires in other things apart from perumAL SrIman nArAyaNan, HE will certainly not save a person from the never ending cycle of births and deaths. HE will not cut it as he is under the unnecessary ties that a person has in his life. Eventually, HE will not take the person unto HIS lotus feet. Hence, aruLALa perumAL emberumAnAr asks, if a person is cognizant of the nature of a soul yet has interests in other stuff, then what is the use of possessing that knowledge in the first place. There is a question that arises at this juncture. Does it not suffice if a person realizes and is cognizant about the fact that the inherent nature of a soul is to be subservient to perumAL? Will this knowledge make perumAL happy and eventually earn HIS love and sympathy towards a person? thalam koNda thALiNaiyAn: This phrase describes the incarnation of perumAL in the form of thrivikiraman. Once upon a time, there was a person known as “mahAbhali” who wanted to rule over the three worlds, i.e., bhUlOkam, bhuvar lOkam and suvar lOkam. In order to fulfill his desire, he performed a penance. These three worlds were under indirA’s possession. Since his property was under threat by mahAbhali, indhra went to perumAL and surrendered before HIM. perumAL protects everyone who had surrendered unto HIM. So, HE HIMSELF went as the dwarf “vAmana” to the place where mahAbhali was performing his penance. As a part of penance, the person who does it has to offer anything that a person who seeks, asks for. perumAL went as a seeker (vAmana) and requested for three feet of land. 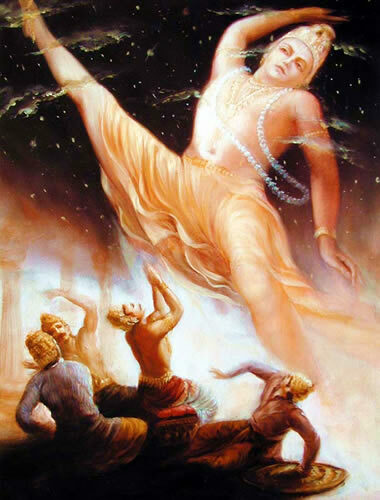 mahAbhali offered to give vAmana three feet of land. vAmana immediately grew massively to measure the land with HIS three foot. HIS one feet measure the entire earth. HIS second foot measured the entire sky. HE measured 14 worlds (seven above and seven below) with HIS two feet. Since HE did not have anything to measure for HIS third feet, HE put his third feet on mahAbhali’s head and pushed him to pAthALa lOka. Thus, HE rescued indirA and ensured that there is no problem to his 3 worlds in terms of ownership. In this pAsuram, “thalam konda thALiNaiyAn”, would mean the ONE who measured the earth and the sky. anRE thanaiyozhindha yAvaraiyum ALudaiyAn anrE avan: At the time when HE measured the whole universe, did HE not send the message to everyone that HE is the owner of everyone except HIM and everything in this universe? HE is in fact the master of the universe and we all are HIS servants. When HE did this act, HE not only bolstered the point that HE is the only one permanent master that we all have, but HE also was so happy about the fact and stood as thrivikrama in that posture. thiruppANAzhvAr says “uvandha uLLaththanAi ulagalam aLandhu”. HE was happy because HE could touch everyone, who are his servants, with HIS feet. This was similar to how a mother would be happy by hugging her sleeping child. Having described this, one would have a question as to why would such a merciful person leave HIS children suffer from the cycle of births and deaths forever? The reason is explained below. A person forgets perumAL and HIS help. He involves himself in mundane activities, tries to collect material wealth, and becomes obsessive about that. As a result, he is so into the cobweb of material wealth that he forgets about himself and his true identity. Even if he listens to the advices of his guru, he cannot leave his materialistic pursuit due to the interest he has in them. Even if he says words like “adiyEn” etc, to refer that he is a servant of perumAL, he may still continue to seek benefits apart from perumAL. If this is the case, perumAL waits for the time when he realizes that it is a mistake and then yearns for only perumAL’s lotus feet. Until that glorious time happens, perumaL will not protect a person who does not want and yearn HIM in the first place. The condensed essence of this is what thiruvaLLuvar says “piRavip perunkadal nIndhuvar, nIndhAr iRaivan adi sErAdhAr” and “paRRuga paRRaRRAn paRRinai appaRRaip paRRuga paRRU vidaRku”. nammAzhvAr says “aRRadhu paRRenil uRRadu vIdu uyir”. Thus, in these first three pAsurams of pramEya sAram, namely, “avvAnavar”, “kulam onRu” and “palam”, the condensed meaning of praNavam (Om) was explained. The next four pAsurams (4th to 7th) talk about the second word “nama:” in “Om namO nArAyaNAya”.